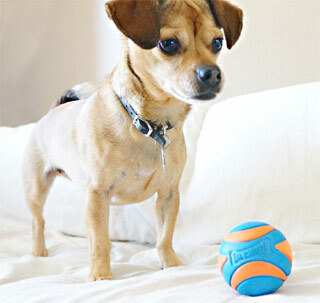 Our favourite dog ball just got even better. 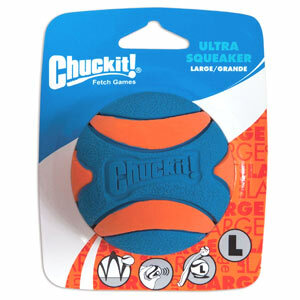 Chuckit Ultra Squeaker Ball is a squeaky dog ball that is bouncy, buoyant, easy to see and very durable. 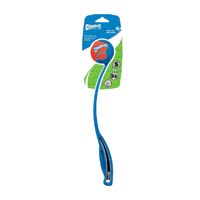 Your dog will love it and because it endures, you will love it to. 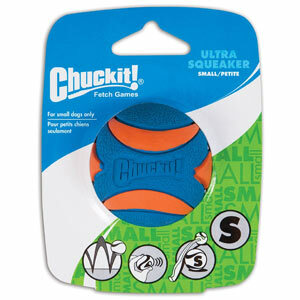 Ultra Squeaker Ball is light yet tough and virtually indestructible. Like the ever popular standard Ultra Ball, it is a hollow natural rubber ball with high bounce. 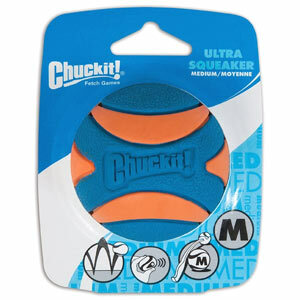 With its bright colours, interesting texture and moulded-in squeaker, it definitely has the fun factor. It is easy to clean too. 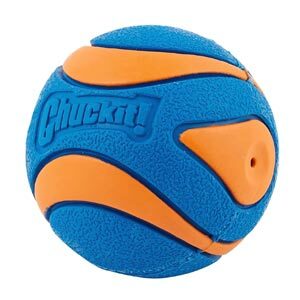 Developed to have high bounce, high buoyancy, high visibility, and high durability - the value of the Ultra Ball and Ultra Squeaker Ball is easily recognized by dog owners. 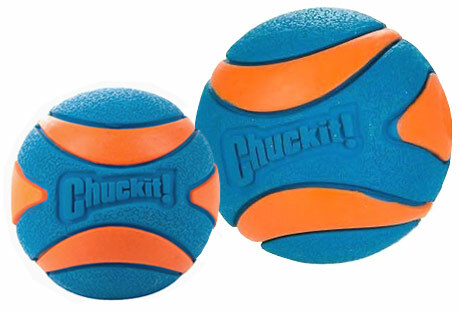 A great dog ball in its own right but also ball thrower compatible for amazing games of fetch. 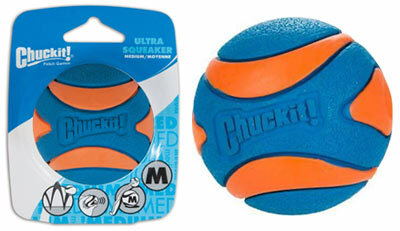 If buying Ultra Squeaker Ball for a Chuckit ball launcher, please check our size compatibility guide below. This larger squeaky ball was given to my daughter's Labrador for Christmas, he absolutely loves it. 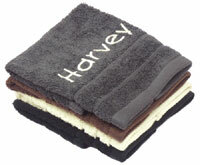 I am thrilled with your customer services and all aspects of ordering and receiving goods. I will definitely use your company again. Thank you everyone. Excellent product, just wish I'd ordered the large ball for our Munsterlander. The balls are apparently indestructible which makes them worth the cost. Efficient service from dfordog. This is an excellent product which is better than the thin plastic squeaky balls I purchased from a major store in Brighton. I have spent a fortune on other 'tough' tennis balls which have not lasted more than a few minutes with my pup. I am so pleased that I found the chuckit ball which a month later is still going strong! The squeaker is an added bonus and my two boys love it! We have been buying the chuckit balls for years now, our Dog absolutely loves them, great bounce, can chew on them for hours & not burst & easy found in the Park- so now they've added in her final addiction. A squeak, Dog heaven for my Lab. Highly recommend. 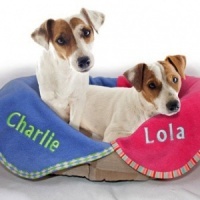 Also bought one for her blind Cousin Dog who was so excited to receive & is always playing now. Great buys. Our JRT loves this ball. Although the squeak didn't last as long as hoped (only about 10mins) but he does make it his mission to get the squeak out with any new toy. However the actual ball is still going strong. Think we've had it about 4 weeks now. Much more durable then a tennis ball. He chomps on it constantly (possibly a god send that the squeaks out) and it still looks like it did when it came out of the packet. Because of the rudder material it's also great for scent work too. We do a lot of this hiding the ball all over the house and making him use his nose to find it. It's a great game, Jambo loves it, mental stimulation and wears him out too! Having bought I don't know how many balls for my Lurcher, this one seems to hve solved the problem. Bright colour and a squeek Yippee! !